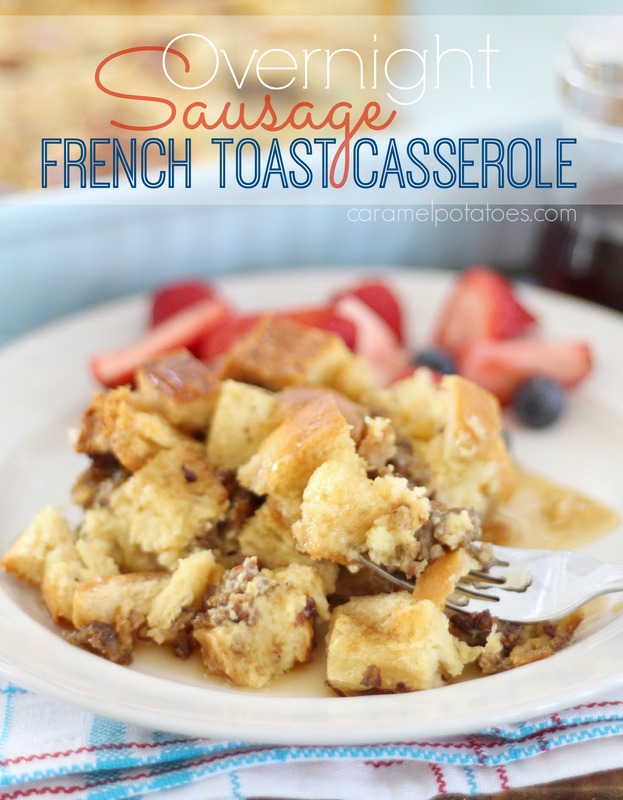 We absolutely love breakfast casseroles, especially when they can be made the night before. 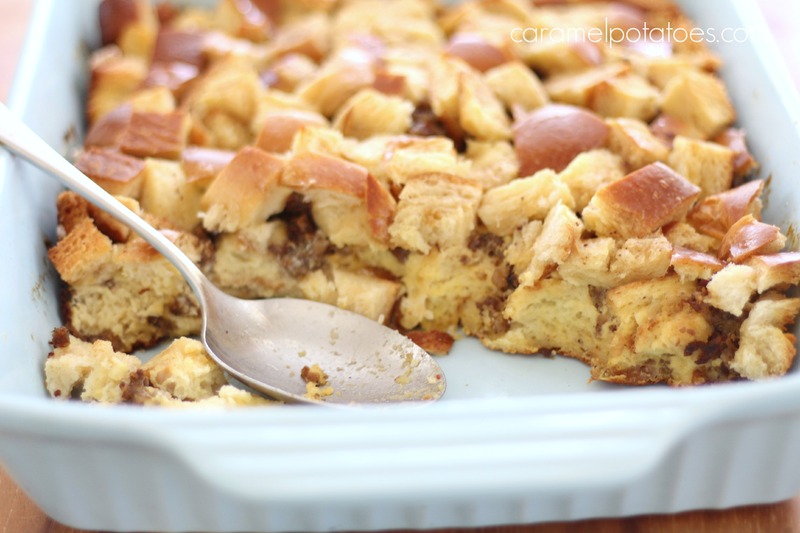 This Overnight Sausage French Toast Casserole combines two of breakfast favorites: Sausage and French Toast. Make it up the night before for a wonderful morning treat. We like to cube Challah bread (or use French Bread), layer it with maple-flavored sausage, and pour a French toast egg mix over the top. 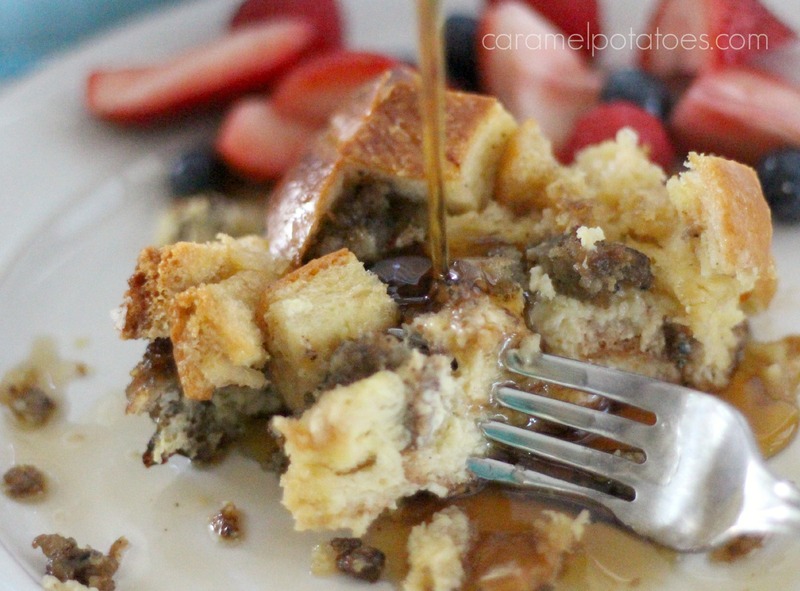 Drizzle with maple syrup and sprinkle with brown sugar, then pop it in the fridge overnight. Serve it hot with maple syrup! Prepare a 13 x 9 pan by coating it with cooking spray. Brown the sausage over medium heat. Drain thoroughly and set aside. Whisk the eggs in a mixing bowl and combine with milk, vanilla, cinnamon, salt, 2 tablespoons brown sugar, and 2 tablespoons maple syrup. Place 1/2 of the bread cubes in the prepared pan. Spread the cooked sausage over the bread and top with the remaining bread cubes. Slowly pour the egg mixture evenly over the pan of bread and sausage, allowing it to soak in. Drizzle the remaining 4 tablespoons of maple syrup over the top. Sprinkle with the remaining 2 tablespoons of brown sugar. Cover with foil and refrigerate overnight. Bake, covered, at 350 degrees for 40 minutes. Remove foil and continue to bake 10-15 minutes or until lightly brown and set. Do you think this recipe could be done in a crockpot after sitting all night? How long do you think? I’m considering doing it for camping in a few weeks…thanks for your input! I’ve never tried the crockpot, but that should work. You’ll just have to keep a close eye on it to see when it’s done. Have fun on your camping trip!